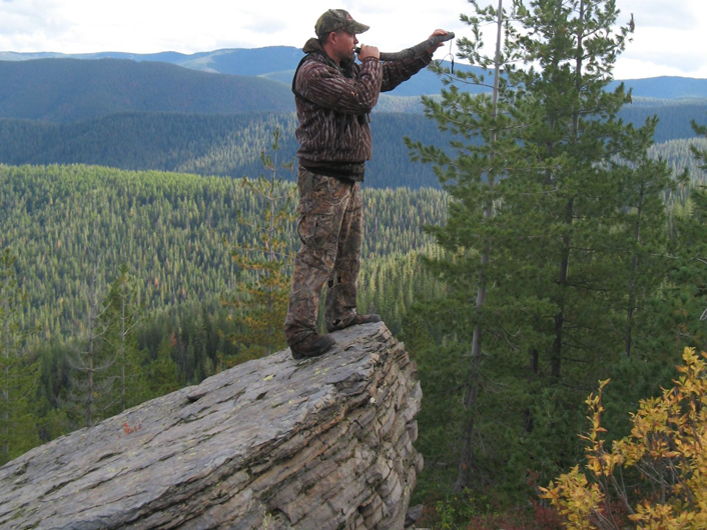 Rifle elk and deer hunting season starts on the fourth Sunday of October in Montana. Our success rate for elk and deer varies on the ability of the clients and their preferences. If your main interest is black bear hunting we have 8 weeks in the spring and 1 week in the fall when we specifically concentrate on harvesting black bear. There are a good number of bear in our area. Archery elk is our passion. It's an experience archers never forget. Archery season for Elk and Deer hunts begins the first Saturday in September and we hunt them until the middle of October. 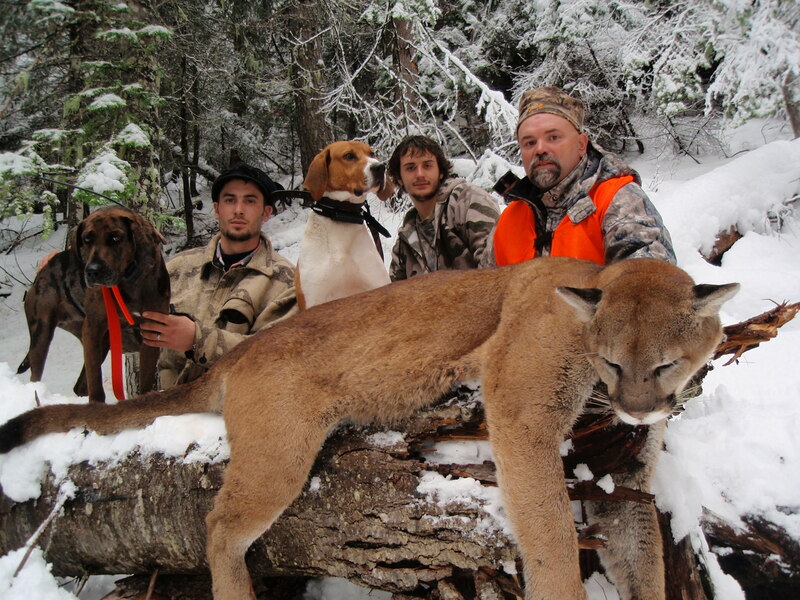 Our Mountain lion hunts are one of the most action packed hunts we have to offer. Our extremely well trained hounds will not stop until the lion is staring down at them through the branches of a big Montana pine. Moose hunting permits is on a drawing basis. There are many moose in our area, but not many people draw for the permits. If you draw a permit, we will be happy to discuss details of this hunt with you. Big Horn Sheep and Mountain Goat hunting permits are on a drawing basis. There are many of these species in our area, but not many people draw for the permits. Take this chance and come hunt with us! Rifle elk and deer season starts on the fourth Sunday of October in Montana. 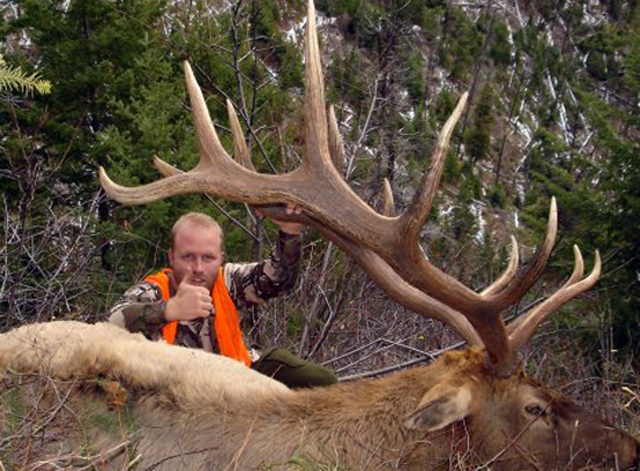 Our success rate for elk and deer varies on the ability of the clients and their preferences. Weather is also a factor. The elk and deer use the same terrain, so you can hunt both at the same time. This makes for a great combo hunt. The area has both whitetail and mule deer. The mule deer rut earlier than the whitetail here. So if you are interested in a mule deer buck schedule your hunt for week two or three. If you are interested in a whitetail buck schedule your hunt for week four or five. This area holds some of the oldest age class animals in the state. Our elevation we hunt from is 2500 feet to 7500 feet, due to this we have resident herds of elk and deer that do not leave the area when heavy snows come and will just move lower in elevation. The area we hunt for elk and deer is almost 2 million acres and by covering as much as we can by glassing and on foot, with an extensive offseason-scouting program, this makes for an excellent hunt. Your guides will only hunt you to your ability so please come in the best shape you can and practice shooting some longer ranges if possible. Most of these hunts are conducted from a nice warm lodge, but we can also spike camp in the backcountry when needed to. Archery elk is our passion. It’s an experience archers never forget once they have got a taste of a mature herd bull screaming at them within bow range. Archery season begins the first Saturday in September and we hunt them until the middle of October. The elk are in the full rut during this season. The mule deer are in the mountains at this time and the whitetails are using our private land Alf alpha fields heavily. Because of this we usually will concentrate on whitetail deer hunting over the mule deer if the client is too tired to elk hunt or if the client prefers to deer hunt over elk hunt. During archery season we locate bulls by bugling or spotting. We start hunting well before daylight calling in the dark trying to locate bulls. Once the action slows for the afternoon we suggest hunting over wallows until the evening calling session takes place. We hunt from the lodge and use spike camps for clients wanting to access harder and remote areas. We love using the spike camp method because of the ability to move where the elk are instead of being stuck in one spot for the duration of your hunt. If the elk hunting isn’t what the guide feels it should be the guide has the option to move his camp to another area quickly and can bounce from a lodge hunt to a spike camp with ease. Many clients have a hard time leaving the lodge atmosphere because of the great food and hot showers. We also use two lodges so we can access our immense hunting area. 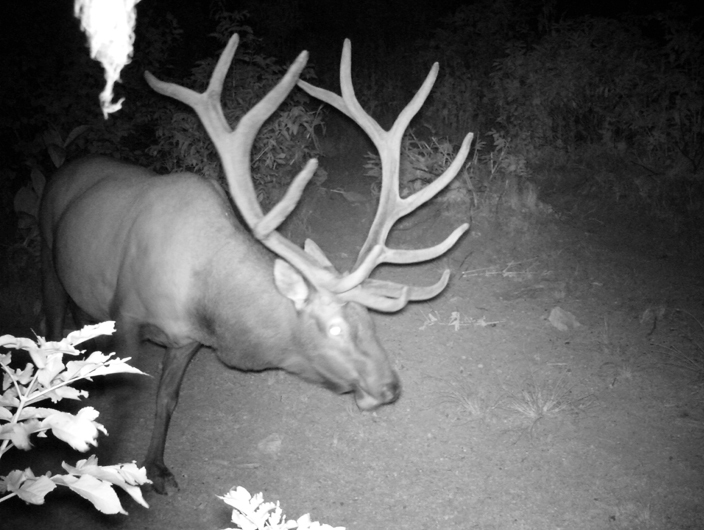 It is important to use extreme scent control and keep the wind in your face as elk have amazing ability to bust you if you are not taking all precautions. We also suggest getting a fall bear license as we usually encounter many black bears at this time of year in the huckleberries. 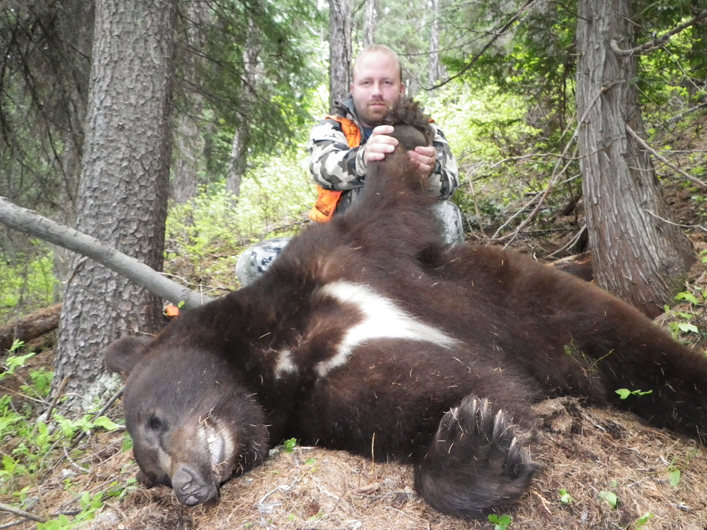 Montana spring bear season starts April 15th and runs until May 15th. Fall season starts September 15th and runs until elk /deer rifle season ends. We encourage hunters to buy a bear tag if they are booking a fall elk /deer hunt. It is not uncommon to see a black bear while hunting for elk and deer. 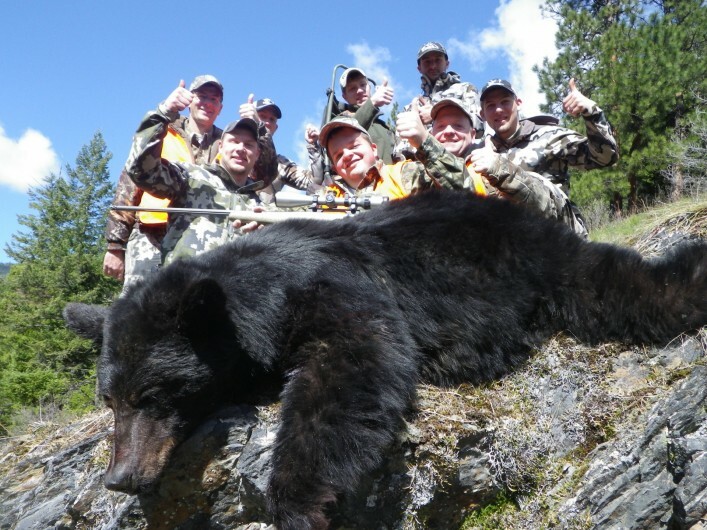 If your main interest is black bear hunting we have eight weeks in the spring and 1 week in the fall when we specifically concentrate on harvesting black bear. There are a good number of bear in our area. Spotting and stalking is the method used in this hunt. 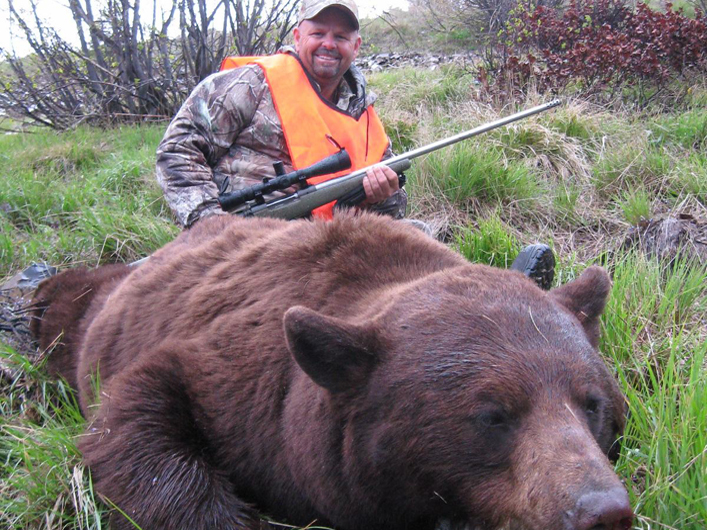 Montana does not allow baiting or dogs and for this reason we are able to harvest older age class bears. We utilize closed roads, open brush fields and natural feeding habitats to hunt for black bear. We are fortunate to have all color phases of black bear in our area. There are black, brown, cinnamon, blond, and black with a white diamond on the chest. This area has one of the highest color-phase ratings in the state. We also border a giant indian reservation that promotes an endless supply of older age class bears. By using the spot and stalk bear hunting method we are able to see all kinds of other native wildlife (elk, mule deer, whitetail, moose, bighorn sheep and turkey). You can turn your spring bear hunt into a combo hunt by adding a Merriam turkey hunt. Use up some of the down time next spring and come chase some amazing black bears with us. Mountain Lion, Moose, Big Horn Sheep and Mountain Goat hunting permits are on a drawing basis. There are many of these species in our area, but not many people draw for the permits. If you draw a permit, we will be happy to discuss details of this hunt with you. 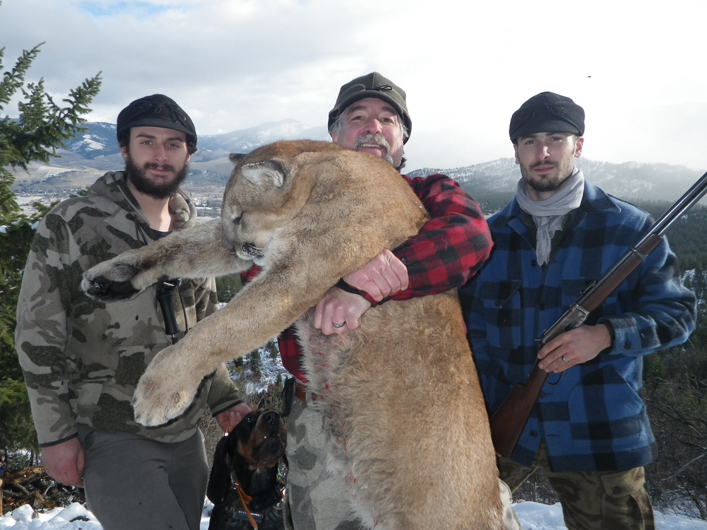 Our Mountain lion hunts are one of the most action packed hunts we have to offer. We hunt the lions with hounds and start our hunts when most people are thinking about going to bed to insure we find the right lion track to chase the next morning. Our extremely well trained hounds will not stop until the lion is staring down at them through the branches of a big Montana pine. Watching the hounds work the track and seeing one of Montana’s most majestic creatures has made this one of our most sought after hunts we have. The hunts are conducted in the winter months between December 1st – April 14. Although our hounds do not need snow to catch a lion it is needed to determine we are running a mature tom. Due to our high mountain lion population we can target mature toms. Over a decade ago they made part of our area a trophy lion permit area. With limited lion harvest our lion population has exploded making it a premier lion destination for big cats. Mountain Lion hunting is now by special permit in our area and also by over the counter quota. Permits must be applied for by August 14. You can begin applying for your permit by July 1st on the Montana Fish, Wildlife and Parks online licensing system. Apply in successive years and each bonus point gives you one extra chance to draw a license. You may obtain one bonus point each year you apply for a permit and make sure to buy the bonus point. Bonus points begin at zero again once you draw a Mountain Lion permit. You will be notified in late September if you have drawn a permit. If successful, you will need to schedule your hunt with us and purchase your Mountain Lion license. You will purchase a $10 conservation license, a $5 dollar permit fee, and a $20 bonus point fee. Once you draw your license you will then buy the $320 mountain lion license. If you do not draw a permit and you want to go that year call us and see if we have availability on the quota hunts. Quota hunts are over the counter licenses and are open from February 1st until April 14 unless quota fills in that district. Come join Cody Carr’s Hunting Adventures for one of the best mountain lion hunts in North America.